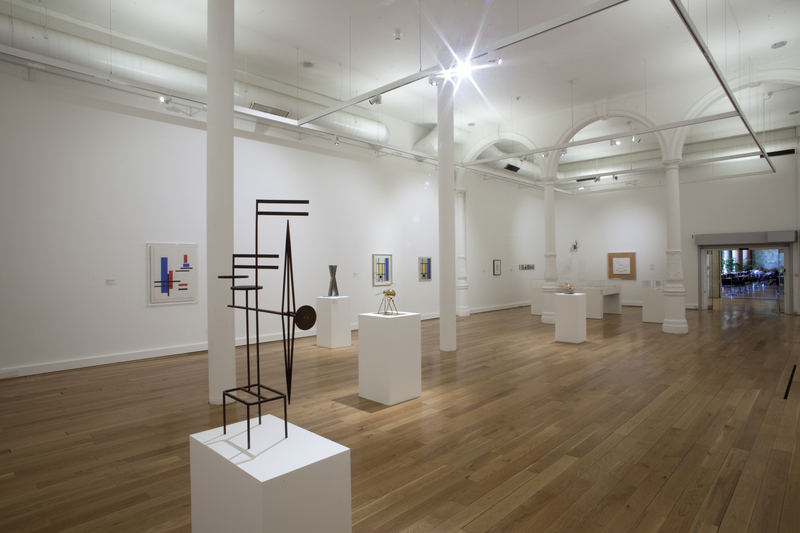 Borrowing its title from the terminology of manufacture and law enforcement, Zero Tolerance at Lion and Lamb Gallery, focuses on the extent to which three contemporary painters, Juan Bolivar, Nick Dawes and Katrina Blannin, employ systematic methodologies, or strict sets of rules, to construct their work. For me, it forms an urgent investigation into an aesthetic, highly relevant to contemporary life, that forms an alternative to the romantic/expressionistic tendency. I think systems aesthetics are being proposed here in other ways too. In Juan Bolivar‘s painting, Anvil, we have a system of signs, that remind me of a set of nested Russian Dolls, the outer one being the perspex framing device that functions both literally, as a transparent cover for the painting, and also as a signal to read the work as participating in the tradition of constructive art. 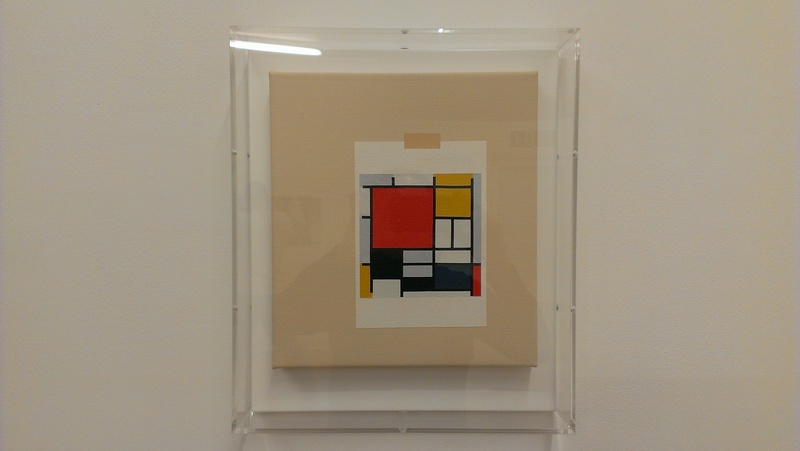 The painting housed by the perspex frame looks like a postcard of a Mondrian, taped to a flat surface. 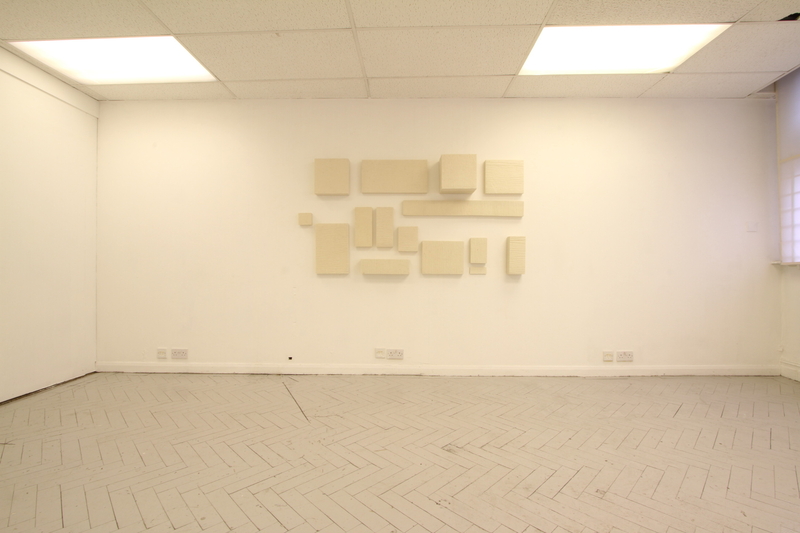 We are presented with a construction containing a representation of a representation of a nonrepresentational painting. I think it is more paradoxical than ironic: a sign that reads “this is not a sign”. 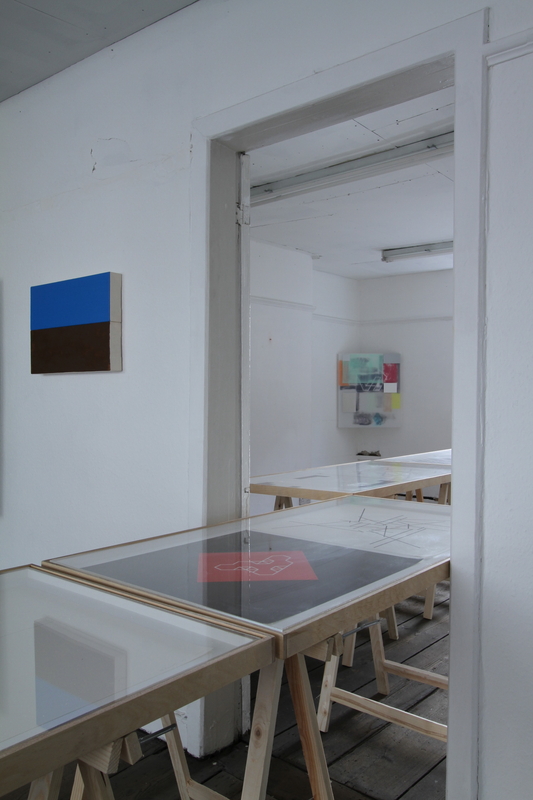 Nick Dawes’ paintings are sign systems in a more literal sense. He appropriates ordinary road signs as subverted content in the style of the Readymade. Crossings features three gloss black “Level Crossing” signs on a matt black triangular canvas, as much recalling the “Give Way” sign as it does also the shaped canvases of late Modernist abstract paintings by artists such as Kenneth Noland or Frank Stella. 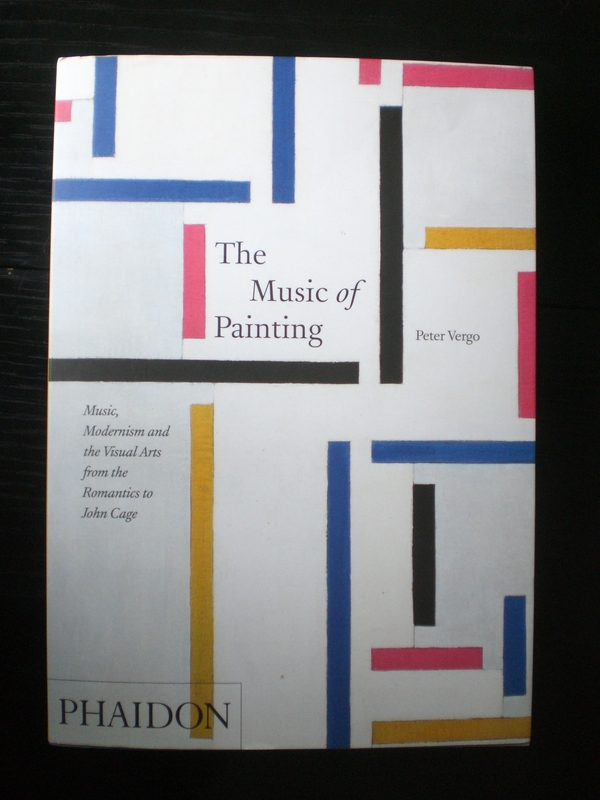 Formalist painting becomes content as much as it also becomes analogous with popular cultural design. I am tempted to say that here a formalist abstraction has become a representation of a road sign that resembles a formalist abstract painting. If Clement Greenberg proposed that Modernist painting, in privileging form over content, could be defined as “the imitation of imitation as process”, I wonder whether in Post-Modernist abstraction the process becomes rather “the imitation of the imitation of imitation”. 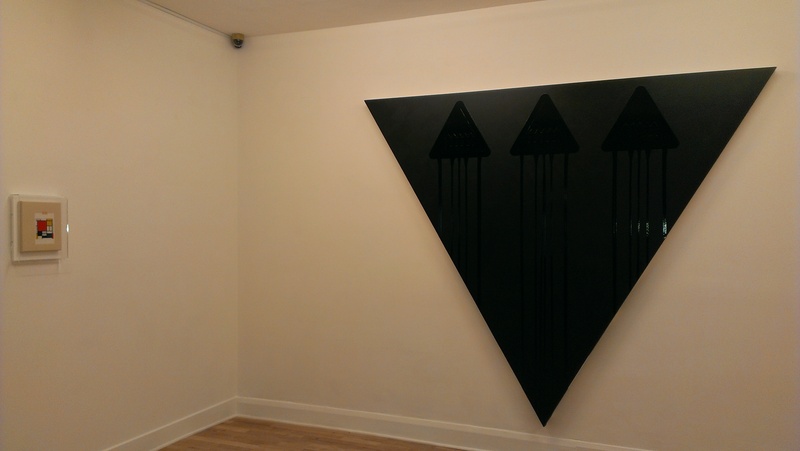 Both Bolivar’s and Dawe’s paintings, can be situated in relation to wider systems, whether high art or popular culture, just as they can to that other sense of the word “system” as in “systematic”, i.e. following a predetermined path, a procedure. 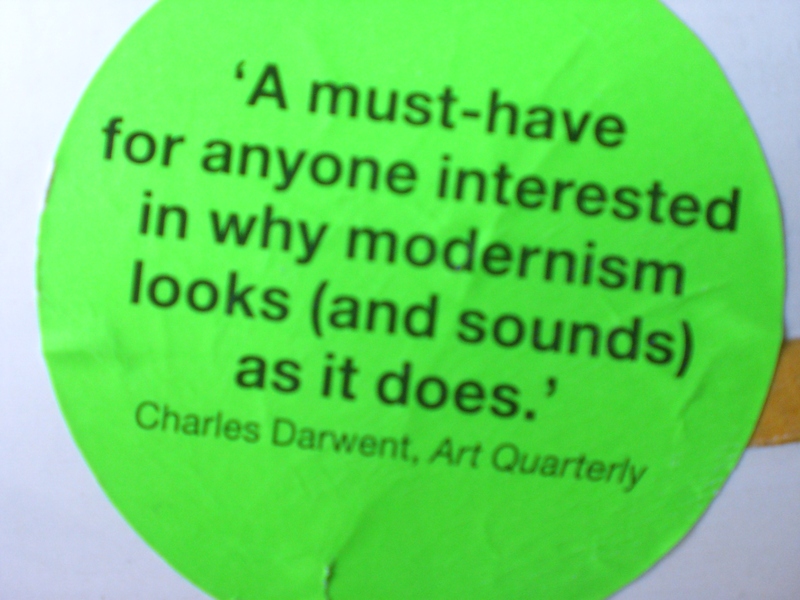 And this is true also of Katrina Blannin‘s work in, I think, a different way. 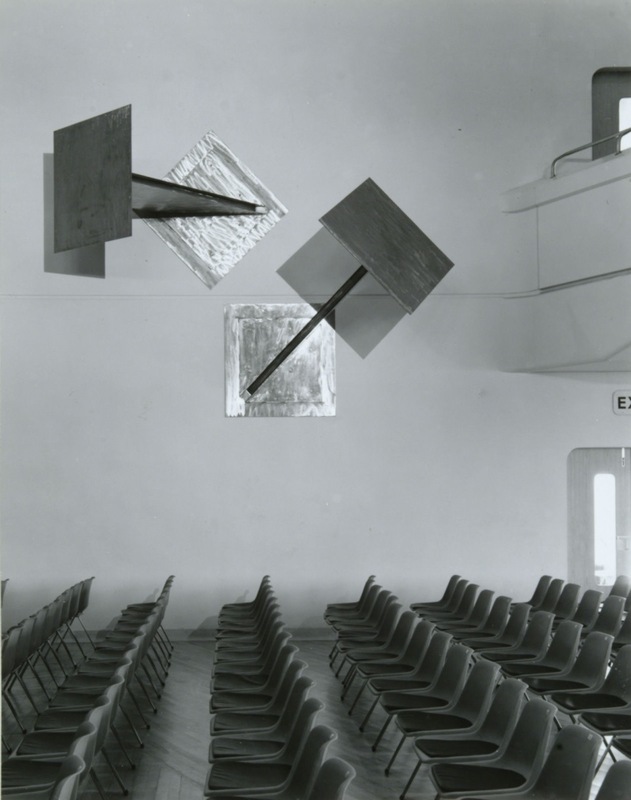 Clearly, Blannin is participating in that other tradition of abstraction that is connected more to Constructivism than to American Abstract Expressionism, the tradition that includes the British Constructionists and the Systems Group where the sense of “system” is a mathematical one. However there is also yet another sense of the word, that I want to explore, at least speculatively, for a moment, in relation to Blannin’s work and that’s the sense of “system” used in cybernetics, where a central concept is that of “feedback”, the process in which information about the past or present influences the same phenomenon in the present or future, forming a chain of cause-and-effect, a circuit or loop: output becomes input. Viewing Three-piece Suite: Red/White (Double Hexad: Contracted, Root and Expanded + 123/321 Tonal Rotation with Shift), I have an experience close to ecstasy, and I deliberately choose the word for it’s inappropriateness when considering a piece that is mathematical, logical, rational. One of the things that I tend to do whenever looking at work of this kind is to count things. Before ever reading the title on the notes sheet I have counted the system or set of canvases that forms the triptych and then counted the triangular motifs that form the expanded system, noting how the white triangles are contained by a red line and the light grey ones by a black line leaving the dark grey ones unable to be highlighted, thus more readily becoming ‘ground’ or negative space against which the other triangles become ‘figure’. I have noted how the three tone/colours are arranged so that the same arrangement of lines (that also differs across each canvas because the widths of each canvas vary) is “coloured in” such that no colour/shape is repeated horizontally, in other words, there’s a tonal rotation with a shift. So, I’m doing all this counting and working out the logic of the piece and it might all seem so rational, cerebral, cognitive, yet I am using the word “ecstasy” that seems to belong more to our experiences of feeling and emotion. But after a few moments of looking (and it does require a few moments, and real looking is also necessary, a mere glance will not do justice to the piece) I find that my emotional state has been affected, I have experienced a shift in state that approaches something of what I think we mean by a word like ecstasy. Where else does this happen? Doesn’t counting and emotion get conflated in our experience of anything that has rhythm? I am thinking of music and dance, where mathematical relationships become transformed into emotion. And there’s another context that I think is even closer to what’s happening to me in front of this painting and that’s the context of hypnosis where a trance might be induced through counting. I could speculate that it’s the tessellating, the shifting of figure and ground, that leads to this shift of state-of-mind, (or emotional state), and this is where I come back to the concept of the “feedback loop”. Surely, it’s not really the object that tessellates at all. 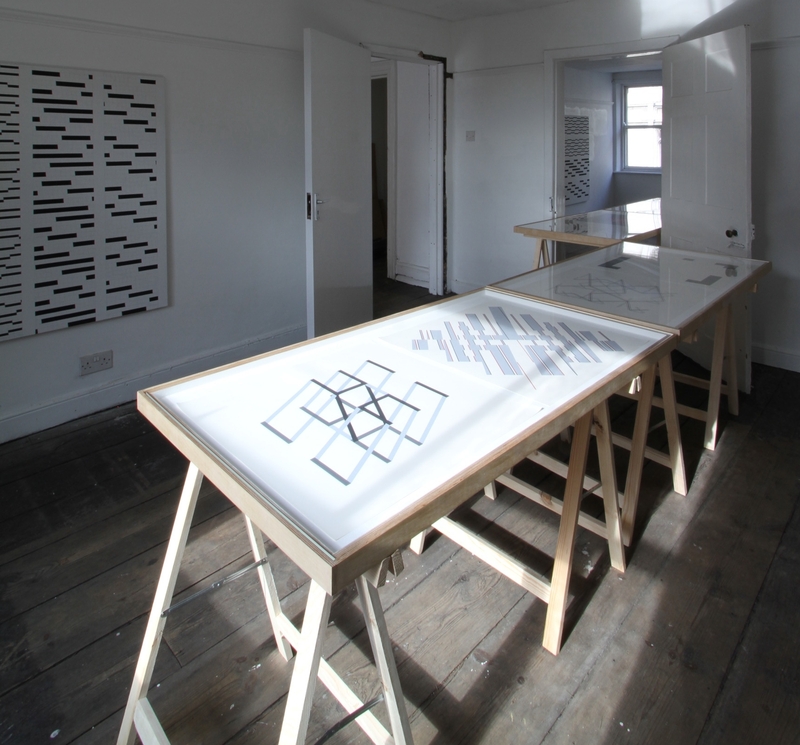 It’s a result of what the viewer does in relation to the object. At any one time, I am likely to see a different tessellation than the one you see. The object hasn’t changed, yet I am seeing something different to what you are seeing. It’s this system of object/viewer that Blannin’s paintings emphasise for me, and I wonder if what’s going on is that output becomes input becomes output in this continuous feedback loop and I experience this as fascinating, and even trance inducing. In all these ways it seems to me that Zero Tolerance is an invitation to “think system”. 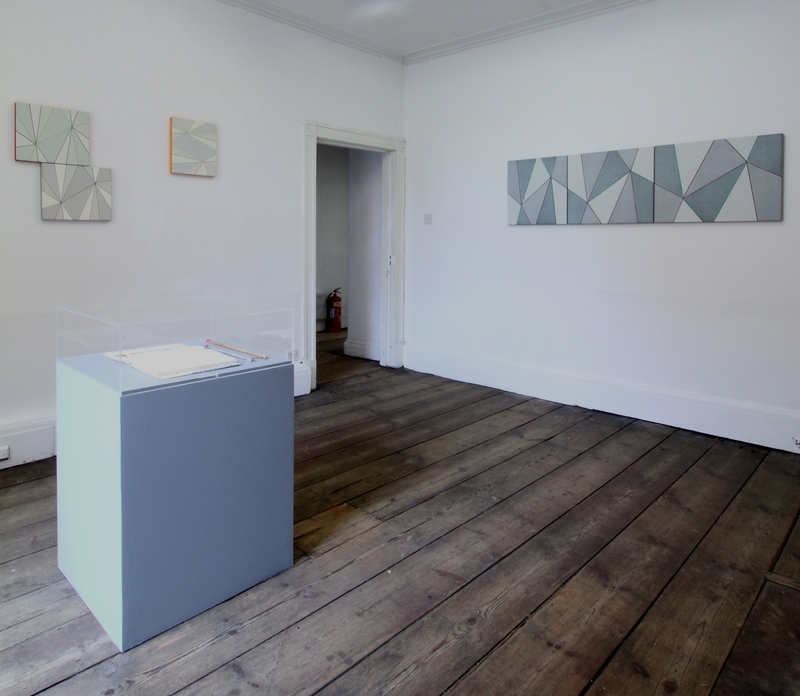 Unfortunately, my brief review here is a bit late and the show has only a few more days to run. 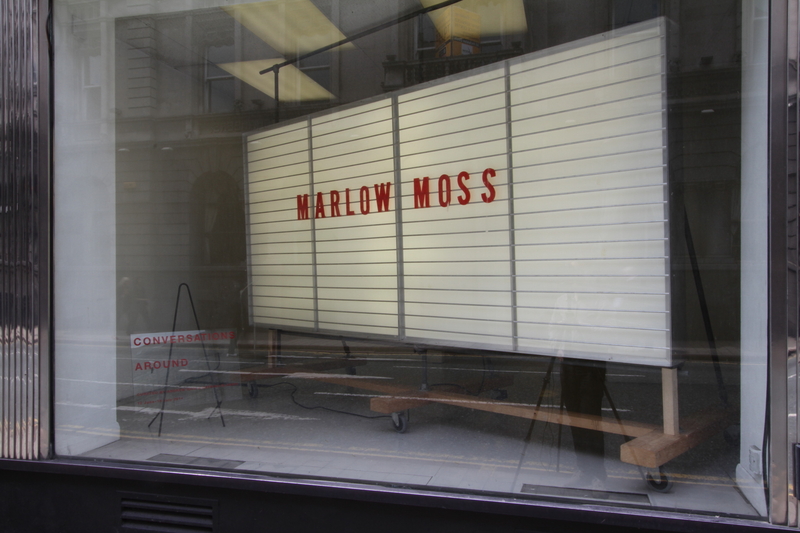 You can catch it at Lion and Lamb Gallery until 22 Feb.
Do I prefer the Nicholsons to the Mondrians? 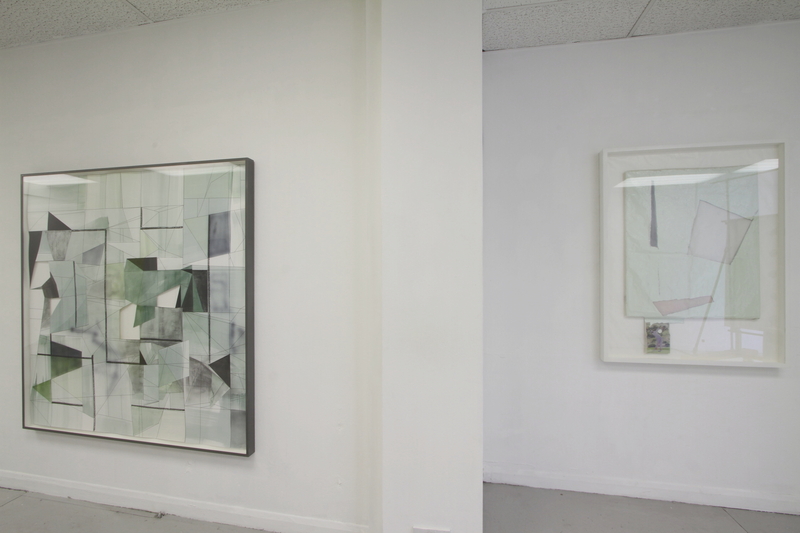 Do I think Nicholsons aesthetic carries greater potential for the future/present of painting? and offers some really interesting answers. Read them for yourself here. She isn’t massively interested in art, but I thought that she might quite like the Mondrians. Imagine my surprise when she was totally underwhelmed. Partly she was bored, and more than that she just didn’t seem to ‘get it’. I have come to think of those paintings as traditional but her reaction showed me that they remain challenging. 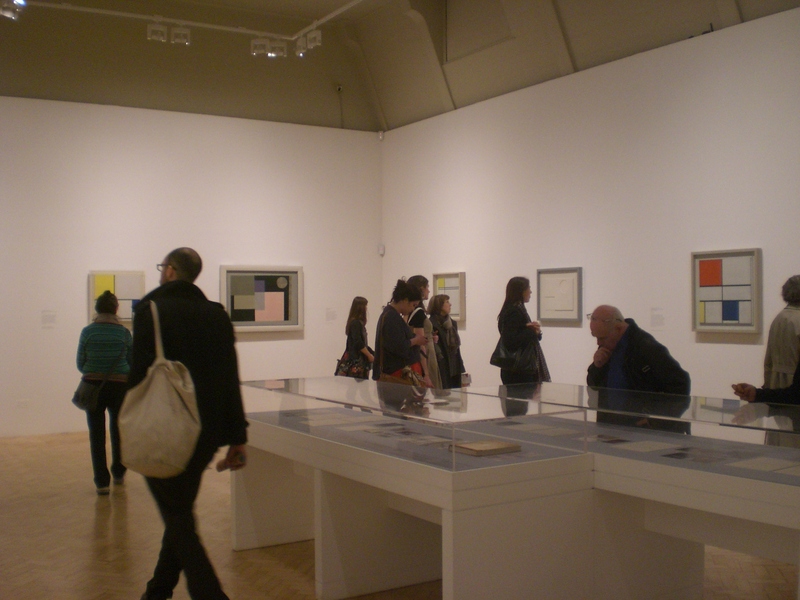 In fact, the fact of abstraction can continue to be challenging, even now 100 years since its birth. I had planned to visit the Alex Hubbard show at Simon Lee the next day and I anticipated her finding that even more of a challenge. 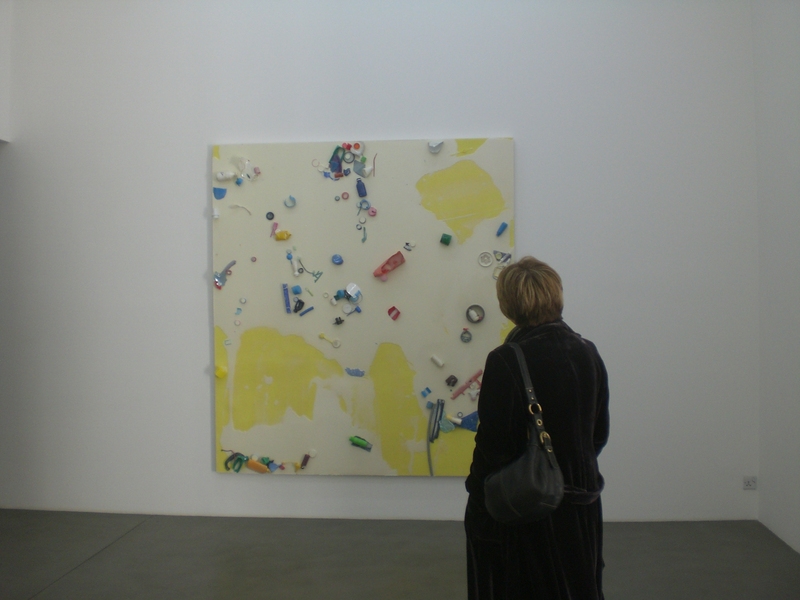 After all, the paintings are virtually monochromes with plastic rubbish embedded into their glossy surfaces, and the videos could be seen as making no sense. But she was fascinated by the videos and watched them with me a few times and she thoroughly enjoyed looking at the paintings. This work is, to my mind, much more contemporary and much more challenging than the Mondrian and Nicholson paintings, yet she could connect with them and enjoy them. Partly she was attracted to the colours, it had not occurred to me how decorative they could appear. 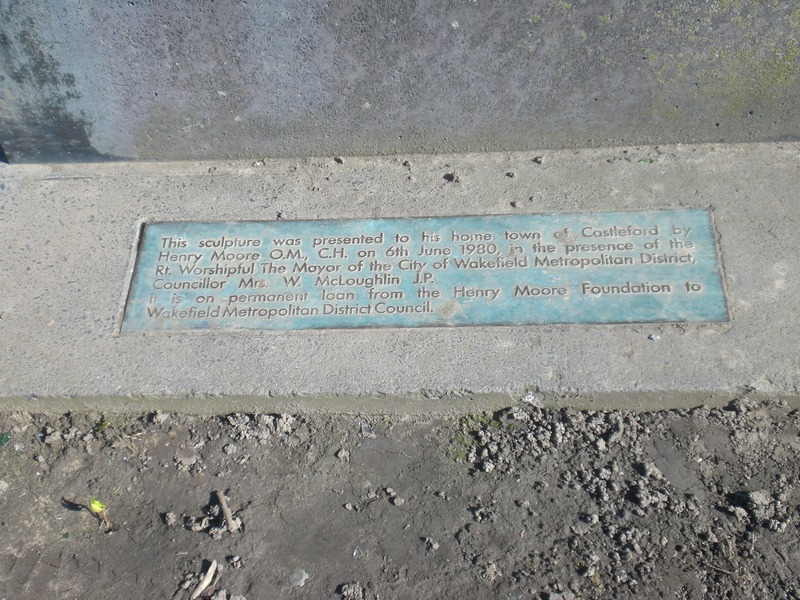 She was also sure that the embedded pieces of rubbish were selected for their colour and carefully placed. At the time I disagreed with her, but now I am beginning to think she may be right. 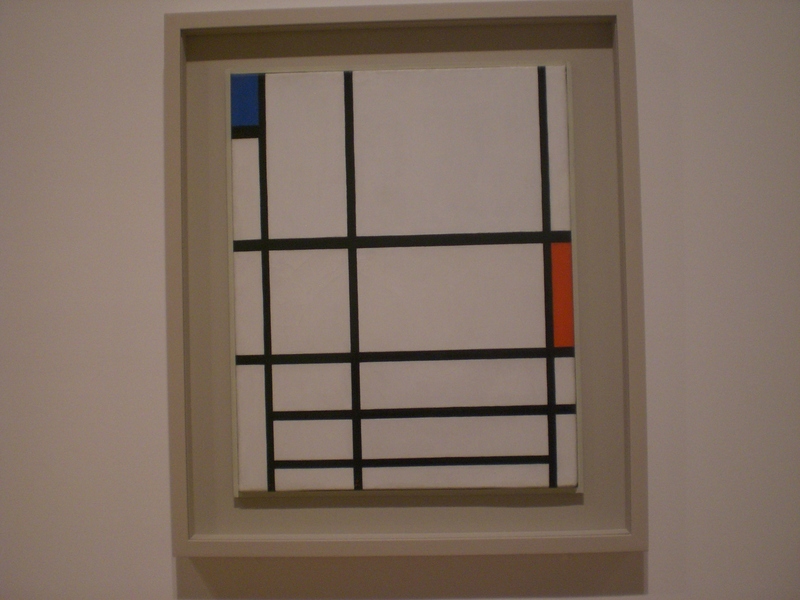 Piet Mondrian suggested that humanity seeks rest within motion, or “repose through movement” and he found an example of it in dance, referring possibly to the foxtrot, he said “each movement is immediately neutralized by a countermovement which signifies the search for equilibrium”. 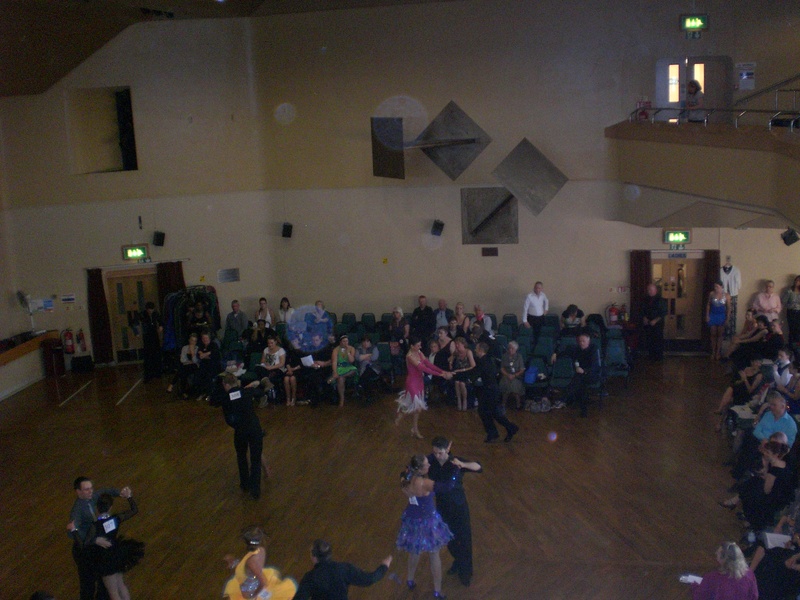 Taking part in the ISTD dance medallist competition (ballroom, latin and sequence) at Castleford Civic Centre on 11 March, I thought that my own foxtrot seemed to have too much repose and not enough movement! 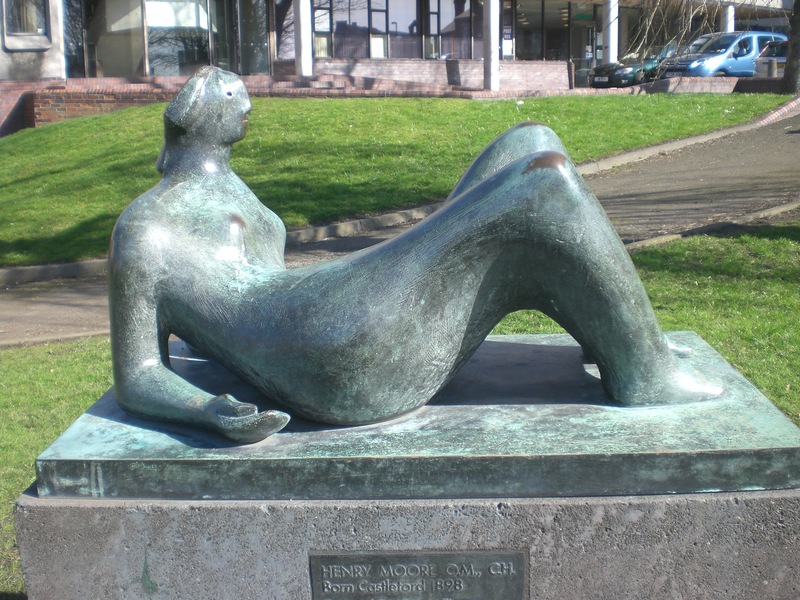 Maybe I was feeling too relaxed after looking at the Henry Moore reclining figure on the way into the centre. 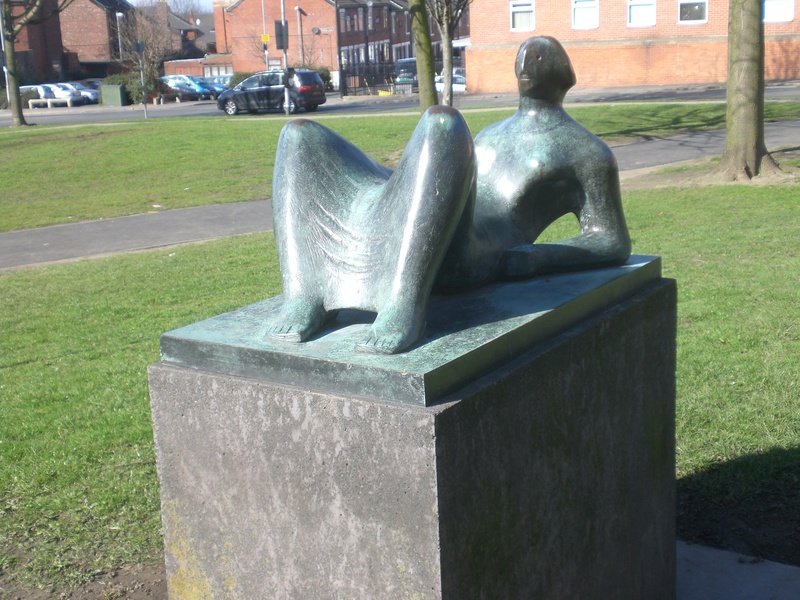 The reclining figure figures a lot in Henry Moore’s oeuvre, and he donated this one in 1980 to Castleford, the town where he was born, the Civic Centre having been officially opened a decade earlier on 24 March 1970. 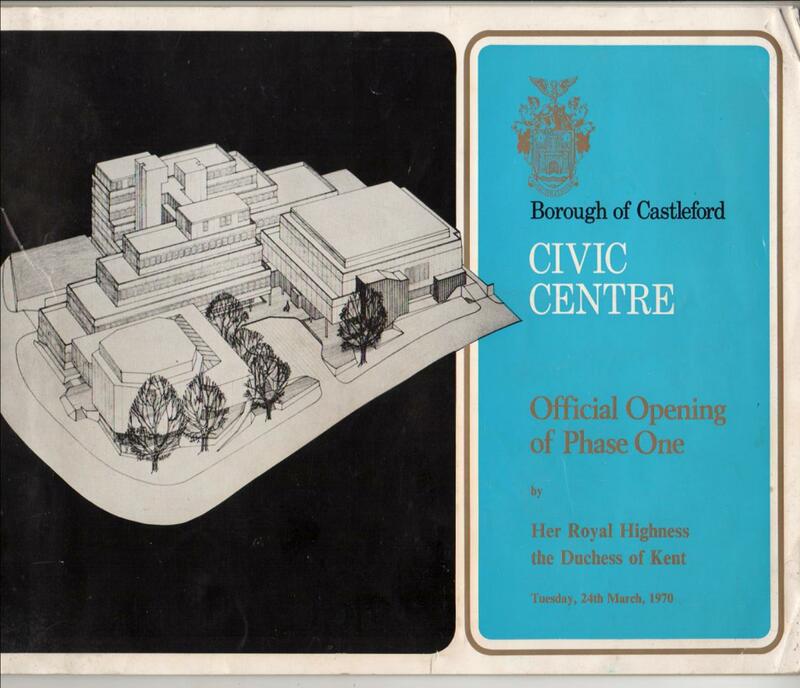 The Civic Centre, a fine example of modernist architecture, designed by Derek Goad, is an optimistic looking building if ever I saw one, even now when it seems to reflect an optimism about the future that is a situated in the modernist period, when perhaps we believed more honestly in “a steady advance from the poor environment of the past to the more pleasant and brighter surroundings of the future”. 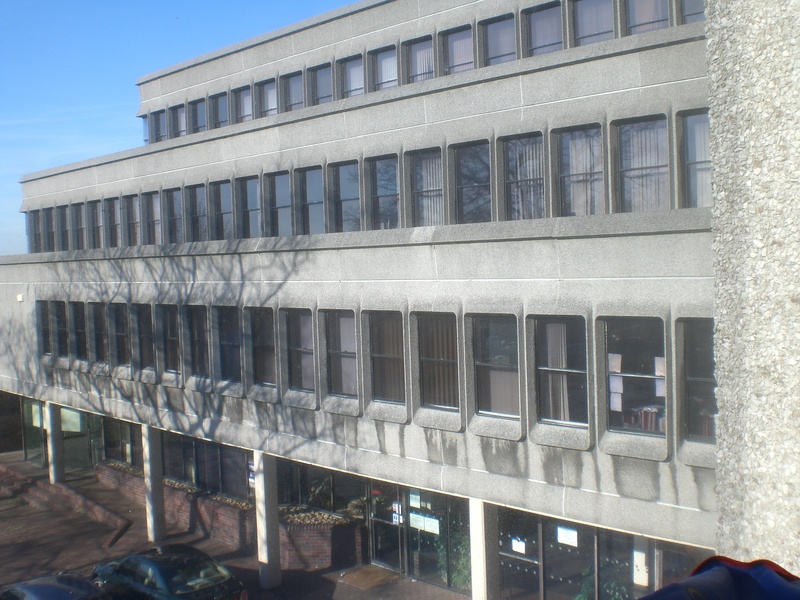 One of the features of the building is its facing in precast concrete panels manufactured from a limestone aggregate chosen for its weathering properties: “it has been found to get naturally lighter in colour with exposure to the atmosphere so counteracting the darkening process caused by the atmosphere itself”. Apart from the darkening beneath the windows this hope, this countermovement does seem to have been realised. 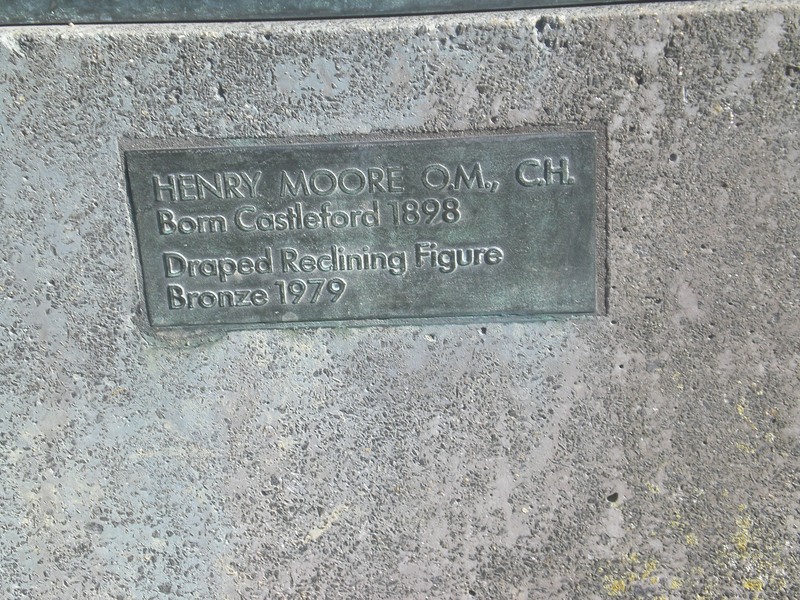 I find it a hopeful place also by association, because of the activity (medallist competition dancing) for which I have been here a few times now. I go in filled with hope anyway! Sometimes I come out feeling even better than when I went in, other times less so. 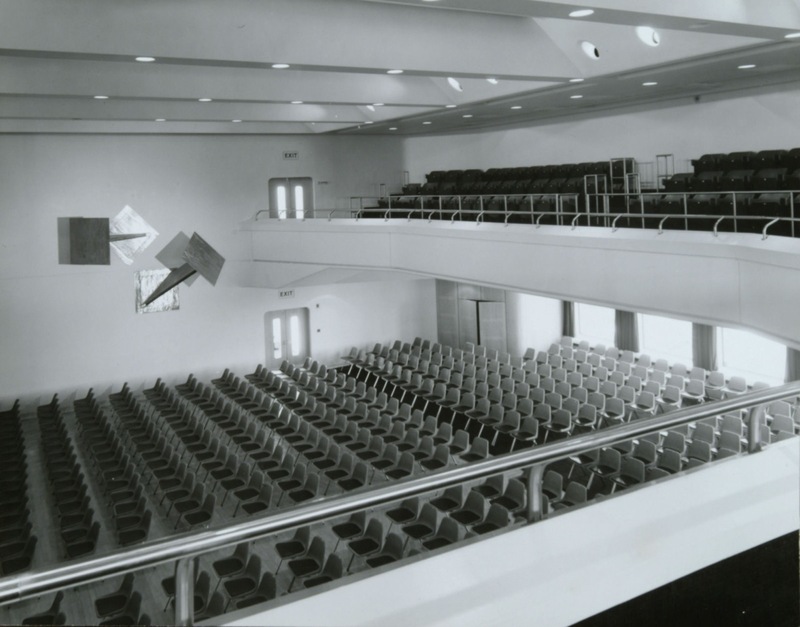 I first started to become interested in the building when I looked across the dancefloor/theatre and saw the wall sculpture, comissioned for the opening in 1970, silent, static, yet visually rhythmic (movement through repose perhaps). The dynamic rhythms of the dancefloor seem to be echoed in the sculptural forms. 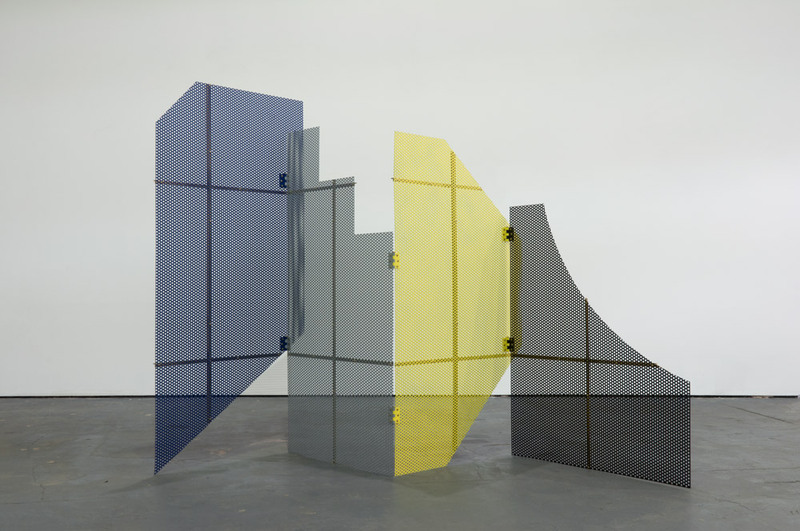 The artist is Diana Dean, who was working with abstract geometric form in both painting and sculpture at the time, and the work, made in stainless steel, is entitled Symmetry in Opposition. 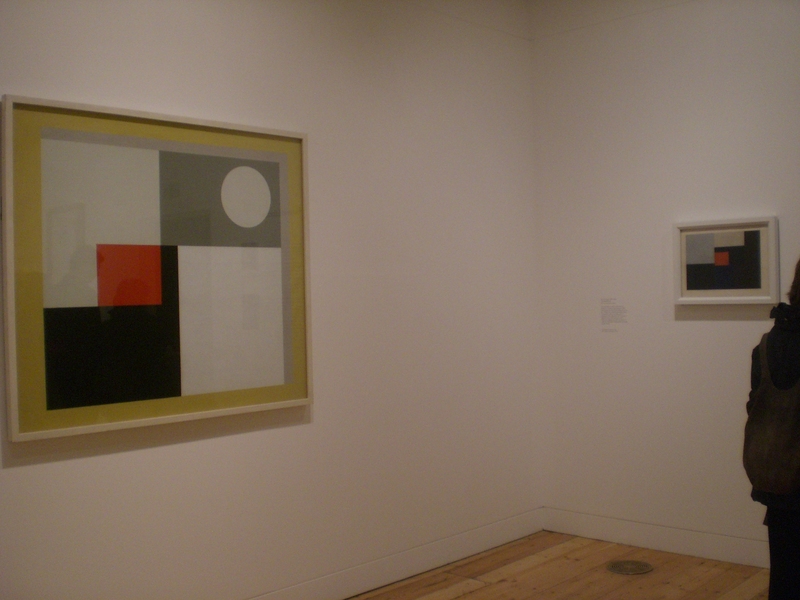 I could wonder to what extent the title also echoes that idea of equilibrium found in the Mondrian quote above. Dean explained to me that at first the two projected squares were facing inwards with two corners touching, and then this changed to the outward projection which is why she called it Symmetry in Opposition. 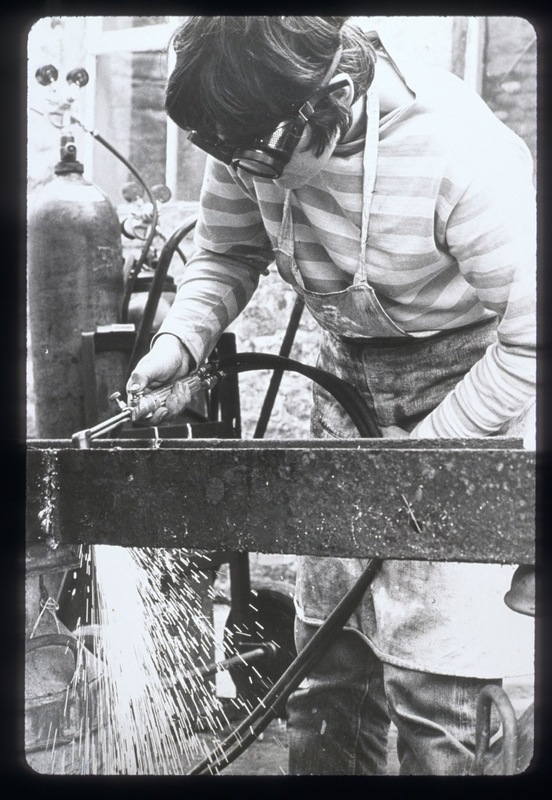 Here are some photo’s of what it looked like in 1970. I wonder if I also find Mondrian’s notion of the neutralisation of opposites in the contrast between the stasis of the final form Vs the activity of its making. Dean moved to Canada in 1975, where she focused on painting and moved away from abstraction, the geometry hidden, as it were, within the structure, supporting the figuration. 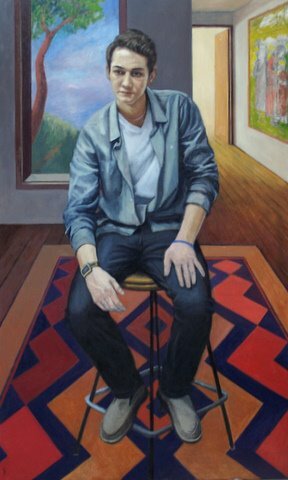 When I contacted her recently she replied saying “I felt it was quite synchronistic to receive your email this week as I had just begun a portrait painting with geometric patterning appearing in the carpet and all perspective lines in the room going to the left eye of the sitter. 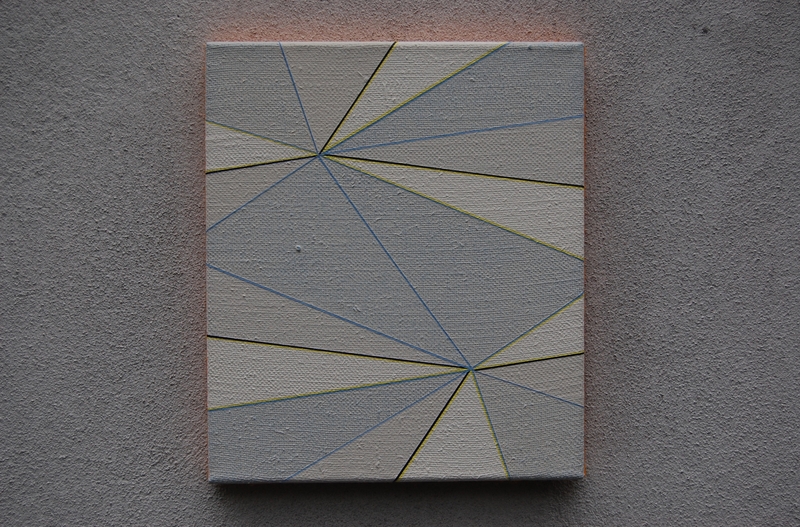 Maybe I am moving towards a new form of geometric abstraction again”. A psychological reading might suggest that we are witnessing a “return of the repressed”.